This means that Rodriguez often suffers from “tries too hard” syndrome during Desperado. It feels like every scene is supposed to dazzle and overwhelm us, and he doesn’t let matters evolve naturally. No, it’s not like Rodriguez screams “look at me – I have money now!” The director remains miserly in his filmmaking ways to this day. But his ambition to overwhelm us overwhelms him and makes Desperado unnecessarily showy much of the time. 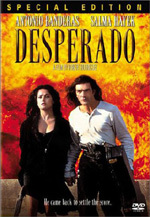 Desperado appears in an aspect ratio of approximately 1.85:1 on this single-sided, double-layered DVD; the image has been enhanced for 16X9 televisions. Mostly the film looked gorgeous, but it lost a few points that kept it from being absolutely top-notch. Sharpness appeared excellent. The movie consistently seemed crisp and detailed. I noticed no issues due to jagged edges or moiré effects, and only a smidgen of light edge enhancement marred the presentation. Print flaws caused some minor distractions. To be sure, the movie looked much cleaner than the grain-fest that was El Mariachi, but given the flick’s vastly larger budget, I expected that. Desperado exhibited occasional specks but it generally appeared clean. Colors provided a high point for this film. The movie demonstrated a rich palette that consistently seemed vivid and dynamic. The hues were tight and full and never suffered from any bleeding, noise or other issues. Black levels were deep and dense, and low-light shots looked appropriately opaque without any concerns connected to excessive darkness. Lose the smattering of specks plus the mild edge enhancement and Desperado would be a glorious transfer. As it stood, the movie looked good enough to earn a “B+”. Director Rodriguez clearly enjoyed the benefits of his increased budget when it came time to mix the movie, and Desperado’s Dolby Digital 5.1 showed what he could do with a little money. The soundfield seemed broad and lively. Music demonstrated solid stereo spread, as the score split nicely into the sides and blended cleanly. Effects really made good use of the various channels. All five speakers got a good workout during both loud and subtle sequences. For example, in an early dream sequence, the sound of one man clapping moved neatly all around the room. Of course, the gunfights came to life very well, as shots flew all around the spectrum. The surrounds weren’t equal partners, but they got a lot of use in this vivid and engrossing track. This disc offers the fourth DVD release of Desperado. First Columbia put out a bare-bones effort in 1997, and they followed that with a special edition double feature in 1999 that paired Desperado with El Mariachi. 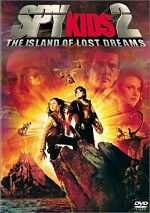 The third release came from a Superbit version in 2001. The extras found here mostly come from that double feature set, which apparently took them from an earlier laserdisc. We start with that release’s audio commentary from director Robert Rodriguez. A running, screen-specific piece, the track doesn’t appear as strong as those for Spy Kids 2 or El Mariachi, but Rodriguez nevertheless gives us an above-average discussion of his work. A “sequel” to the El Mariachi DVD’s “Ten-Minute Film School”, Ten More Minutes: Anatomy of a Shootout actually lasts 10 minutes and 28 seconds. This program mostly focuses on one of the bar shootouts, but it also includes a little material about other sequences. Rodriguez’s use of “video storyboards” dominates the piece, as he shows us how he uses these to preplan shots. It’s not as good as the original “Film School”, but it’s generally an illuminating glimpse at the director’s methods. In addition to filmographies for Rodriguez and actors Antonio Banderas, Salma Hayek, Cheech Marin and Steve Buscemi, Desperado tosses in some promotional materials. We get a Sneak Peek for Rodriguez’s upcoming Once Upon a Time In Mexico. This gives us a four-minute and 27-second featurette that mostly combines shots from the set and soundbites from actors Antonio Banderas, Johnny Depp, Salma Hayek, Danny Trejo, Cheech Marin, Willem Dafoe, Eva Mendes, Marco Leonardi, Julio Mechoso, and Enrique Iglesias. It’s not a deep program, but the glimpses behind the scenes aren’t bad. We also find trailers for Mexico, Desperado, and Love and a Bullet. 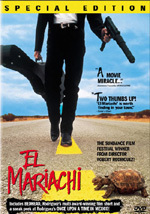 With 1000 times the budget of El Mariachi, Robert Rodriguez created a sequel that didn’t match up to the original. Desperado has its moments, but overall it feels forced and like everyone involved tried too hard to impress us. The DVD presents very good picture and sound plus a decent set of supplements. Action fans will probably find this solid DVD to merit a look, but I definitely prefer El Mariachi and think it’s the more valuable of the two flicks.